the leading yoga studio in Geneva. Showcased in Press Articles and Interviews, INNERCITYOGA has been portrayed in numerous national and international magazines and newspapers, as well as on radio and Swiss national television. Over the years, we managed to move the yoga out from the undergroundand create a lot of interest among all age groups and social classes for a more modern approach to a healthier and happier lifestyle. With this background, we have been interviewed many times to give expert advice to journalists. On one hand, journalists are impressed by the concept of moving the INNERCITYOGA yoga studio in the beautiful sun-lit and centrally placed location and offering numerous amenities and extras. On the other hand, our approach of offering a smartly conceived and safe approach of yoga for students’ different bodies managed to stir up things in the yoga world. What makes INNERCITYOGA the ideal interview partner is the long expertise in diverse fields of yoga, be it for therapeutical reasons or yoga in the corporate world. With continuous personal studies and ongoing training by the studio’s founders and the handpicked team we came across many different yoga traditions and had the good fortune to get acquainted with the older generation of yoga masters who were direct disciples of Sri Krishnamacharya. 350'000+ Views of the “Yoga du matin” video with INNERCITYOGA® founder Ioana Pop for Femina magazine. 200'000+ Views of the “Yoga du Soir” video with INNERCITYOGA® founder Ioana Pop for Femina magazine. We are always happy to cooperate with journalists on articles about yoga. Please address all interview requests here. 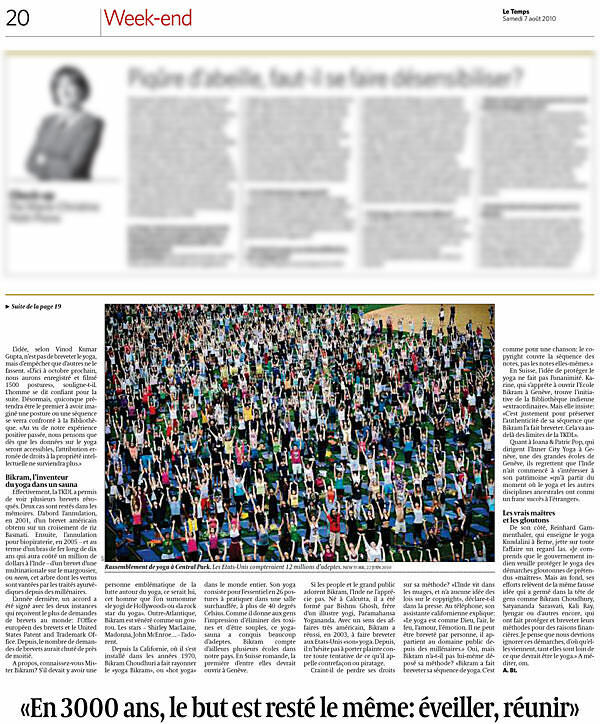 Full page interview in Tribune de Genève with INNERCITYOGA studio founders and special guest Bryan Kest, founder of Poweryoga. Two-page spread in popular Swiss magazine L'Hebdo about INNERCITYOGA mission of Urban Yoga in Geneva, 2003. L'Hebdo interviews INNERCITYOGA Studio Director Patric Pop about the growing interest for yoga in Geneva and the Suisse Romande. Year after year, INNERCITYOGA gets recommended by Geneva's Le Renard sur la lune city guide. French Yoga Journal showcased Ioana and Patric's Yoga for Athletes of INNERCITYOGA in the first edition. Yoga Journal France portrays the INNERCITYOGA founders. New York Magzine recommends in 2013 INNERCITYOGA for its full-service yoga studio and the English-speaking teachers, as well as the outdoor yoga during summer. INNERCITYOGA inthe chic magazine Genève sur la Terre. The most distributed feminine magazine in french-speaking Switzerland, Femina, showcasing INNERCITYOGA's Ioana Pop for the highly popular video series. Carpe Diem sponsored Yoga Events at INNERCITYOGA.